Randomly looking through my Blogger files, I found this hugely important post from 2008 that for some reason remained in DRAFT mode and was never published. Here it goes. I know the title of this posting sounds a little dramatic, but I've just been informed by my editor at St. Martin's Press that Calligraphy of the Witch is going to be remaindered soon. The novel was released last Fall and it has, sadly, sold just over 1,500 copies. Hence, there are no plans for a paperback and that beautiful book, that story that took me over 16 years to write, will now sit on the remaindered shelves of a few bookstores and eventually will go out of print. And the worst part is, it's all my fault. Or rather, it's the fault of my academic life that got in the way of my being able to push the book the way I pushed Desert Blood, which continues to do spectacularly well and has recently been released in Spanish. The reason I was able to go on a 4-month book tour with Desert Blood is that I was on sabbatical the year the novel was published, and I had the time to travel from coast to coast, doing readings and booksignings. I had time to sit at the computer and develop a website for the novel, blog about the book tour, keep people informed about the next event. But I also had a publisher that set up the entire book tour, that arranged the flights, that reserved the hotel rooms, that got me hooked up with radio interviews and bookstores. Arte Publico Press, and specifically Marina Tristan, did all that work to help sell Desert Blood. It was no surprise, then, that the book sold out of its first run by the second month of the book tour. That it is now in its third edition, available in paperback, in Italian, and in Spanish, and that the website continues to receive over a 100 hits a day. 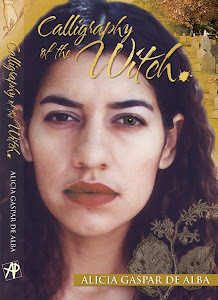 When Calligraphy of the Witch was sold by my new agent, Regina Brooks, to St. Martin's Press, I was ecstatic, as any Chicana author used to publishing with small presses and university presses would be. I thought it was my break-through into the mainstream publishing world, and it made sense that it would be Concepción's story that would put me on the mainstream literary map. And it might have. 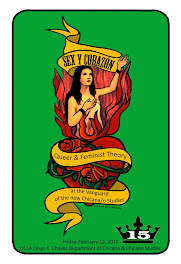 Had the date of the novel's release not coincided with my being appointed the new Chair of the César Chávez Department of Chicana/o Studies at UCLA. Had I been able to do even half of the readings and booksigning I did for Desert Blood. Had I had the chance to peddle the book portal to portal through cyberspace. But no, instead, I had to learn how to administrate an academic department. I had to deal with an 8-year departmental review, a retention case from hell, a site visit, a Development agenda, meetings ad nauseum, personnel cases, individual faculty issues, a graduate program proposal to rewrite and resubmit to the powers that be, as well as my own teaching to do, and somewhere in there, in my copious spare time, I had to keep working on my own research, trying to finish my anthology on the murdered women of Juárez after four years of putting it off. St. Martin's Press did little (if any) publicity for the novel, I couldn't afford a book publicist, and I had no time to schedule readings and booksignings. In fact, the only reading I did from Calligraphy of the Witch was in October 2007 at the Hudson River Valley Writer's Center in Sleepy Hollow, New York, at Sergio Troncoso's invitation (thanks for that opportunity, Sergio). The novel received a couple of good reviews, among them one by Rigoberto González that was published in the El Paso Times. But it was not reviewed in the New York Times or the Los Angeles Times. St. Martin's Press did not organize a reading for me at the Los Angeles Times Festival of Books, even though that event takes place at UCLA. And I didn't actually create my own website until last summer (with the help and direction of my wife, Alma López, who is so talented and knowledgeable about these things). So it doesn't surprise me that Calligraphy of the Witch is going to die on the vine, but it does make me very sad, and not a little resentful that my career as an academic has been largely responsible for the novel's death. And since I've used the dreaded R-word (resentment, which I try to avoid like the veritable plague), I might as well indulge it full-force here, and say that I really envy those writers who have been able to prioritize their writing, who probably make a whole lot less money than I do but who have the one thing we can never make up, and without which it is impossible to produce any work of art, which is time. As Ivon Villa in Desert Blood says, "you can make up money, but you can never make up time." I know that part of my relative obscurity in the book world is that I have chosen to be an academic, I have chosen not to write about the popular themes and issues that have defined "Latina/o" literature in the mainstream literary world and instead have focused on a colonial lesbian nun, the murdered women and girls of Juárez, and a mestiza accused of witchcraft in 17th-century New England--none of these is mainstream material, but each I think makes a contribution to raising consciousness about a person or an issue that too few people in the English-speaking world know anything about. I have made these choices, and I don't regret them. But I am also paying the price of it now. Still, despite the fact that I know what role I played in the demise of the novel, I can't believe that Calligraphy of the Witch has sold just over 1,500 copies in a year. I wish I'd known about the phenomenon of book trailers earlier than last month, when I read about it in the current issue of Poets and Writers. 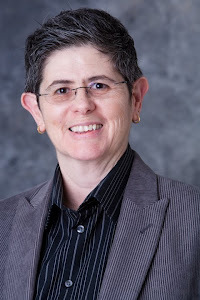 As soon as I read that article, I talked it over with Alma, and she got busy putting one together for me, with the help of Chicana performance artist par excellence, Adelina Anthony. We published it on YouTube on election night, and it's a great piece in which Adelina is performing the part of Concepción's daughter, Hanna Jeremiah, at the opening of the novel while behind her flash images of the "witches" and the "Devil's book." The trailer also features my cat, Luna Azul. You can watch it anytime, just click on Calligraphy of the Witch to watch it on YouTube. Hannah Jeremiah is played by the inimitable Adelina Anthony in the trailer. But it turns out that we were too late. A year late, to be precise. Not that a single book trailer would have substituted for a book tour or a radio interview or even a website, but it would have helped give the book a presence in cyberspace, and at least virtually, would have brought the book to people's awareness, and perhaps would have sold a few more copies. Alas, I have to close now because one of the meetings I have to attend in my academic life today awaits. The good news is that my first year as Chair of the department rendered fabulous results. We got a glowing 8-year review report from all of your reviewers, internal and external alike, we retained that faculty member we very nearly lost to the East Coast, and I finished the rewrite of the graduate program proposal and got it submitted on time to the powers that will determine by hopefully Spring 2009 whether or not we get to have a M.A./PhD program in Chicana/o Studies at UCLA. And believe it or not, I did get my anthology on the murdered women of Juárez finished (with the good-hearted labor of my graduate research assistant, Georgina Guzmán) and it is now under contract with University of Texas Press. So not everything is bleak on my horizon. And I guess I can sell autographed first editions of Calligraphy of the Witch through my website. Still, I'm sad about the book's short shelf life. That should never have happened. And I guess the lesson here for me is that a book cannot sell itself. Writing it is only part of what a writer has to do. And you as a reader can help, too. If you're looking for a Christmas present, order Calligraphy of the Witch. Or send an email to Daniela Rapp at St. Martin's Press and urge her to get the book out in paperback so that I can have a second chance at peddling Concepción's story. Okay, off with my writer's hat, on with my academic garb. And I'm off to another day at the office.